Introduction: Patients with diabetes often require complex medication regimens. The positive impact of pharmacists on improving diabetes management or its co-morbidities has been recognised worldwide. 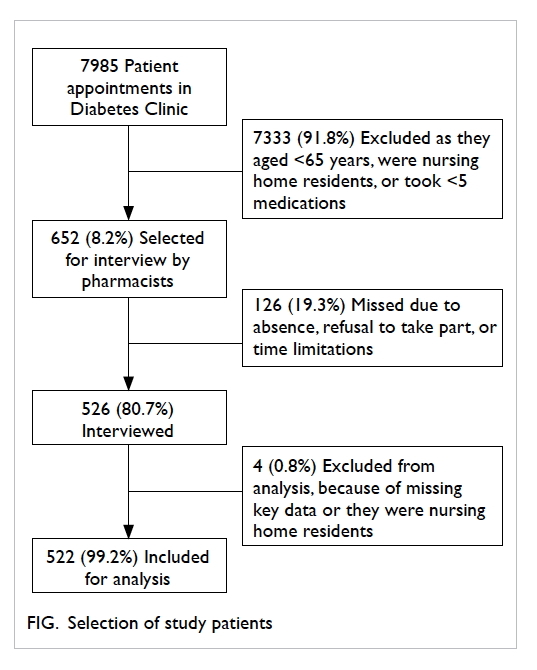 This study aimed to characterise drug-related problems among diabetic patients in Hong Kong and their clinical significance, and to explore the role of pharmacists in the multidisciplinary diabetes management team by evaluating the outcome of their clinical interventions. Methods: An observational study was conducted at the Diabetes Clinic of a public hospital in Hong Kong from October 2012 to March 2014. Following weekly screening, and prior to the doctor’s consultation, selected high-risk patients were interviewed by a pharmacist for medication reconciliation and review. Drug-related problems were identified and documented by the pharmacist who presented clinical recommendations to doctors to optimise a patient’s drug regimen and resolve or prevent potential drug-related problems. Results: A total of 522 patients were analysed and 417 drug-related problems were identified. The incidence of patients with drug-related problems was 62.8% with a mean of 0.9 (standard deviation, 0.6) drug-related problems per patient. 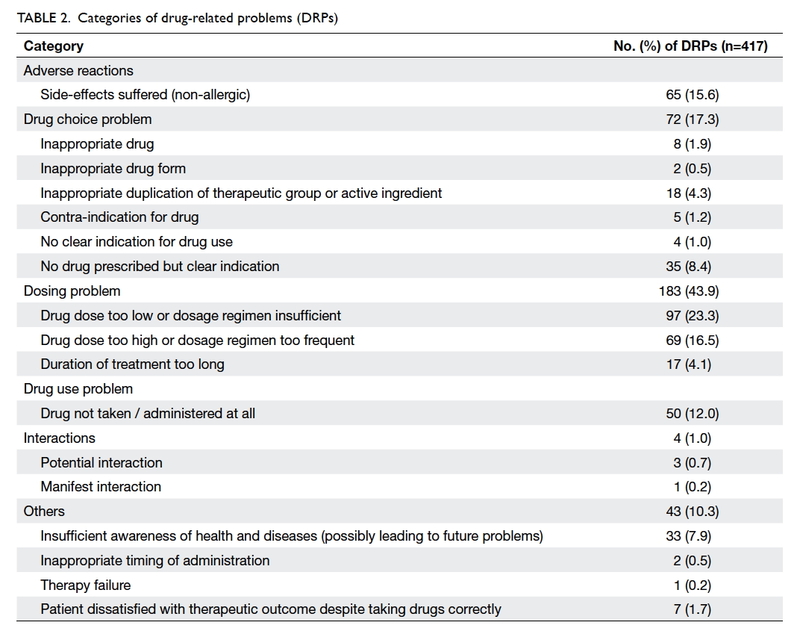 The most common categories of drug-related problems were associated with dosing (43.9%), drug choice (17.3%), and non-allergic adverse reactions (15.6%). Drugs most frequently involved targeted the endocrine or cardiovascular system. The majority (71.9%) of drug-related problems were of moderate clinical significance and 28.1% were considered minor problems. Drug-related problems were totally solved (50.1%) and partially solved (11.0%) by doctors’ acceptance of pharmacist recommendations, or received acknowledgement from doctors (5.5%). Conclusions: Pharmacists, in collaboration with the multidisciplinary team, demonstrated a positive impact by identifying, resolving, and preventing drug-related problems in patients with diabetes. Further plans for sustaining pharmacy service in the Diabetes Clinic would enable further studies to explore the long-term impact of pharmacists in improving patients’ clinical outcomes in diabetes management. Pharmacists make an important contribution to the identification, resolution, and prevention of drug-related problems by medication reconciliation and review. Most problems were related to dosing with moderate clinical significance according to Dean and Barber’s validated scale for scoring medication errors. Over half of the clinical interventions initiated by pharmacists were accepted or acknowledged by doctors to improve medication management. Collaboration between pharmacists and other health care professionals is valuable for the improvement of medication safety in the management of diabetes. The positive impact of pharmacists in improving diabetes management or its co-morbidities has also been recognised by interventional and controlled observational studies worldwide.14 Greater overall improvement in glycosylated haemoglobin, fasting plasma glucose, blood pressure, cholesterol levels, renal outcomes, and medication adherence has been demonstrated in patients who received pharmacist-led diabetes services compared with the standard care.12 14 15 16 17 18 19 20 21 22 23 24 25 26 27 28 29 30 Few studies, however, have been conducted in Hong Kong.17 29 In view of inadequate available data and potential for expansion of local pharmacy services, more studies are required to investigate the future development of a sustainable diabetes service provided by pharmacists. This study aimed to characterise DRPs among Chinese diabetic out-patients, and to define the clinical significance and outcome of pharmacist interventions; thereby highlighting their contribution to the detection, resolution, and prevention of DRPs to improve medication safety and diabetes management. An observational study was conducted weekly in the Diabetes Clinic at Queen Mary Hospital (QMH) from October 2012 to March 2014. The study protocol was approved by the Institutional Review Board of the University of Hong Kong (HKU)/Hospital Authority (HA) Hong Kong West Cluster. Informed consent was not required for the study. Nursing home residents were excluded due to their relatively low risk for non-compliance, compared with community-dwelling elderly patients. The day before the scheduled weekly clinic consultation, two researchers screened the medical history, previous consultation notes, current medications, and latest laboratory results of Chinese elderly patients with diabetes to select high-risk patients. Selected patient records were printed and prepared for quick reference during the medication interview. To facilitate data collection, a memo was attached to the patient’s records to indicate patient selection. Two pharmacists from QMH and one from the HKU attended the clinic on alternate Wednesdays to compile a thorough medication history from selected patients and conduct an independent medication review prior to the medical consultation. During the review, pharmacists also recorded medications not shown in the Clinical Management System (CMS), such as drugs prescribed by general practitioners (GPs), over-the-counter products, vitamins, and herbal supplements. A MR form (Appendix 1) was then completed by pharmacists, documenting the identified DRPs and formulating an intervention proposal. The MR forms were collected following medical consultation, either on the same day or within the next few days. For the selected high-risk patients, pharmacists reviewed the patient’s drug regimen and made recommendations to doctors for adjustment, provided doctors with an updated drug list after MR, suggested a need to further investigate a patient’s condition, provided drug education to patients and caregivers, reinforced the importance of drug compliance to patients, and suggested lifestyle modifications such as dietary control. Drug-related problems were identified from the completed MR forms, and pharmacist recommendations were collected for analysis. The CMS was checked for outcome of intervention. Demographic data—for example, age, gender, drug allergy status, number of regular medications obtained from the HA clinics, and the most current laboratory results, including glycosylated haemoglobin, fasting plasma glucose, and lipids (Appendix 2)—were retrieved from the CMS. Additional information in terms of medication, drug storage methods, smoking status, drinking habits, vaccination record, and latest readings from self-monitoring of blood glucose (SMBG) was also collected. Demographic data were tabulated as frequency and percentage using Microsoft Excel 2010. Primary outcomes included the frequency and categories of DRPs, drug classes involved, clinical significance of DRPs, and outcome of pharmacist interventions. The incidence of DRPs was also calculated as the percentage of patients with at least one DRP. The clinical significance of DRPs was assessed to determine their actual or potential consequence for patient health outcomes. Using a validated scale,35 four independent reviewers (two pharmacists and two doctors) scored the severity of each DRP from 0 (without potential effects on the patient) to 10 (lead to a fatal event). A mean score of <3 indicated a minor problem (very unlikely to cause adverse effects), 3 to 7 indicated a moderate problem (likely to cause some adverse effects or interfere with therapeutic goals), and >7 indicated a severe DRP that could likely cause death or lasting impairment. During the study period, a total of 652 patients were included based on the selection criteria; 526 (80.7%) were interviewed, of whom 522 (99.2%) were analysed (Fig). The mean (± standard deviation) age of the 522 patients was 75.2 ± 5.4 years (range, 65-91 years). The number of prescribed regular HA medications ranged from 5 to 17 with a mean of 9 ± 2. The demographics and characteristics of patients are shown in Table 1. A total of 417 DRPs were identified. Among the 522 patients analysed, 328 (62.8%) had at least one DRP and the mean number of DRPs per patient was 0.9 ± 0.6. The most prevalent DRP category was related to dosing (n=183, 43.9%), followed by drug choice (n=72, 17.3%) and non-allergic adverse reaction (n=65, 15.6%). The subcategories of each of them are listed in Table 2. 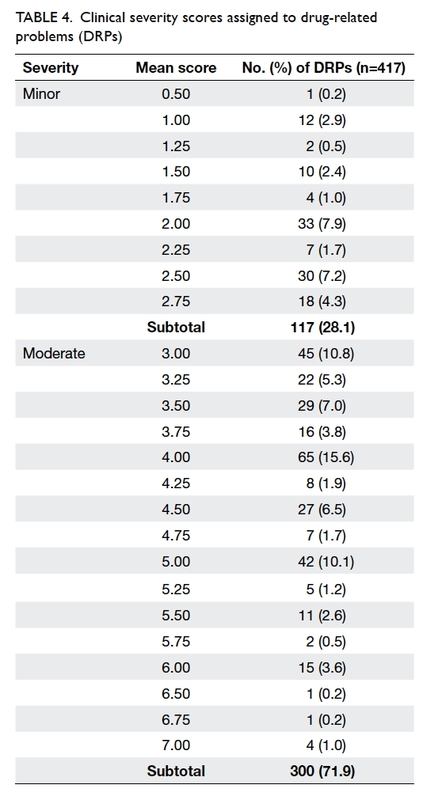 The most common classes of medication involved were those targeting the endocrine system with 190 (45.6%) DRPs, followed by cardiovascular system with 159 (38.1%) DRPs (Table 3). The mean clinical severity scores assigned to DRPs ranged from 0.50 to 7.00. The majority of DRPs (n=300, 71.9%) were classified as moderate with the remainder (n=117, 28.1%) considered minor. No clinically severe DRP was identified (Table 4). As Table 5 shows, modifying drug regimens or reinforcing compliance by doctors or referral to pharmacists solved 209 (50.1%) DRPs. On the other hand, 46 (11.0%) DRPs were partially resolved by doctors adjusting prescriptions, although not according to pharmacist recommendations; 62 (14.9%) DRPs were not resolved due to patient reluctance to change prescriptions, resolution considered unnecessary, or for unknown reasons; 23 (5.5%) DRPs had an unknown outcome because these were non-compliance issues not acknowledged by doctors. The majority of DRPs were dosing problems (43.9%), with “drug dose too low or dosage regimen insufficient” as the largest subcategory. 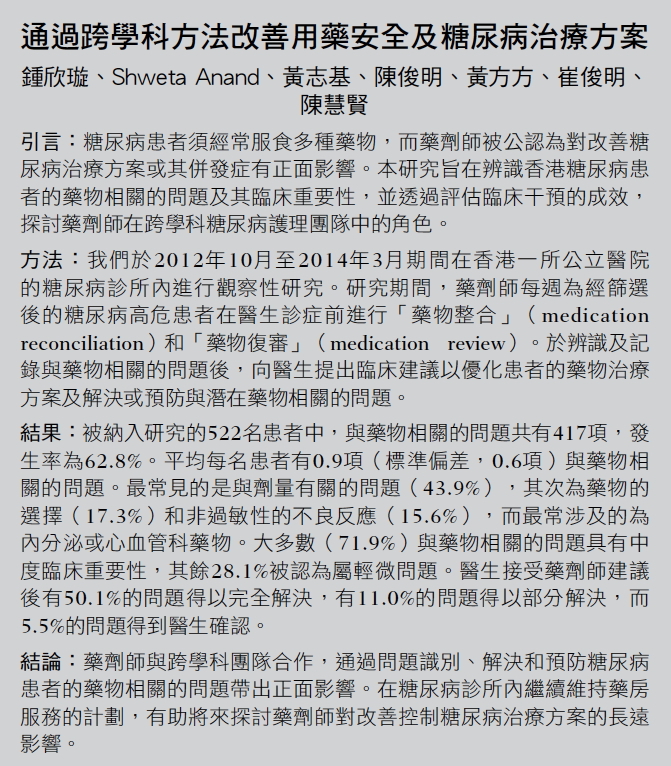 In contrast to the lower percentage (5.9%-21.6%) in five overseas studies,9 10 11 12 36 our high prevalence of dosing problems was in line with a local study of medication incidents among hospital in-patients,38 mostly arising from self-adjustment of dosage or frequency, confusion about previous dose changes and dosage modification by GPs or doctors overseas. These highlight the pivotal role of local pharmacists in conducting MR, reviewing drug dosages to ensure safety and efficacy, monitoring patients’ metabolic control regularly as well as reminding patients and/or their caregivers to maintain an updated medication list and follow the latest drug label instructions. Drug choice problem was the second most common DRP; 17.3% of DRPs related to this category, which is comparable to the findings of two overseas studies (9.1%, 23%)9 36 but deviating from others (31.8%-30.2%).10 11 The most common subcategory was “no drug prescribed but clear indication”, such as the omission of angiotensin-converting enzyme inhibitor/angiotensin-receptor blocker (ACEI/ARB) in patients with microalbuminuria or patient’s reluctance to use insulin. Hence, pharmacists have a role in advising doctors to adhere to the latest treatment guidelines and educate patients about the treatment benefits of each drug class.39 Other causes of problems surrounding drug choice included drug duplication and changes to drug choices by GPs to prevent side-effects. This suggests that some DRPs might have arisen due to the lack of a common platform between the public and private health care sector for sharing patient information. Pharmacists can make a valuable contribution by establishing a patient’s drug history by MR and by liaison with different health care sectors. The majority of DRPs were classified as moderate. Among similar overseas studies, only one analysed the clinical significance of DRPs, in which 87% had high or medium clinical/practical relevance.10 These findings could not be readily compared with the present study because of different assessment scales, potential variations in reviewers’ clinical experience,35 and unknown relative proportions of cases with medium and high relevance. Over half of the DRPs were totally solved as doctors implemented pharmacist recommendations. The acceptance rate was somewhat similar to that observed in two overseas studies (60.2%-62.7%).12 13 The physicians acknowledged the provision of service by pharmacists and were more aware of the written recommendations provided by pharmacists. In particular, the value of verbal communication between different health care professionals in resolving or preventing DRPs has been recognised in earlier studies,10 42 43 44 45 suggesting potential improvement in the acceptance rate if pharmacists had more time to hand over DRPs by speaking with doctors. The outcome of pharmacist interventions could also be influenced by doctors’ clinical experience and familiarity with the new service. Doctors’ acceptance level could have been underestimated since some of them might have neglected or missed written information from pharmacists. This highlights the importance of promoting the role of pharmacists to doctors and keeping all participating doctors well-informed. This pilot study allowed for an opportunity to assess the proportion of patients who might be seen by clinical pharmacists in a busy specialist out-patient clinic at a teaching hospital. Approximately 10% of patients were chosen each week and not all eligible patients could be selected owing to time restrictions. The number of patients interviewed was further limited due to time constraints, patient absence or refusal. Local figures from the QMH Diabetes Clinic indicate that approximately 7% to 8% of all patients who attend the clinic are deemed ‘high risk’, based on ongoing work and prioritisation of those taking five or more regular medications. Limited work space was another consideration. A designated area is required to conduct patient interviews. Further arrangements could be made with the medical and nursing staff in the Diabetes Clinic to access better space. 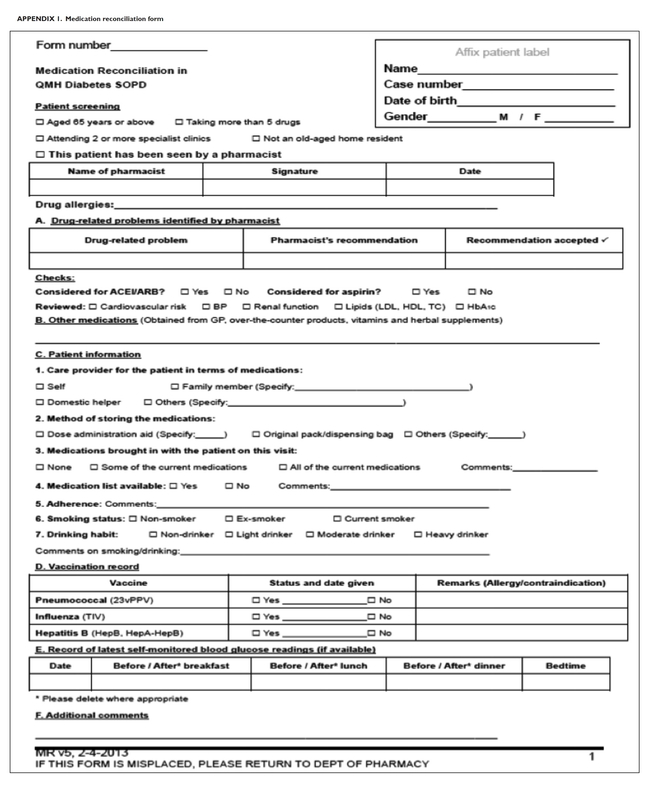 Although completed MR forms were presented to doctors after the interviews, some written information might have been missed with a consequent lack of response to certain DRPs. Pharmacists should ideally have informed doctors about every DRP in person, but this was not always possible due to time constraints and the great volume of patients. In the long run, pharmacists should document DRPs and their recommendations in the CMS. This would enhance visibility and allow doctors to input their response electronically and facilitate organised documentation and easy data retrieval. Upon completion of this study, pharmacists have been continuing to provide MR and medication review services in QMH Diabetes Clinic. They have also been collecting data about DRPs to plan for a sustainable service. Following a longer study period, patient and staff satisfaction surveys could be introduced and also control groups added to enable comparison of the effectiveness of pharmacist intervention. This would further support the extension of hours of service and potentially the setup of similar pharmacy services to other hospitals and diabetes clinics in Hong Kong. Approximately two thirds of patients at the Diabetes Clinic had at least one DRP. 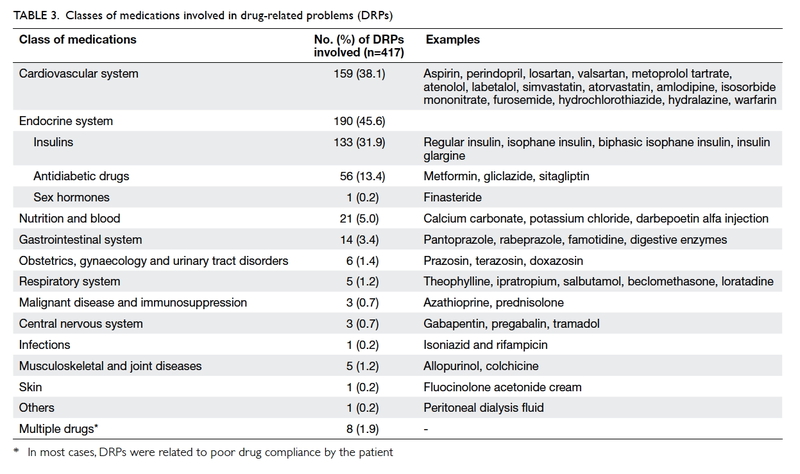 The most frequent categories of DRPs were related to dosing, drug choice, and non-allergic adverse reaction. Drugs targeting the endocrine and cardiovascular systems were most commonly involved. The majority of DRPs were of moderate clinical significance. 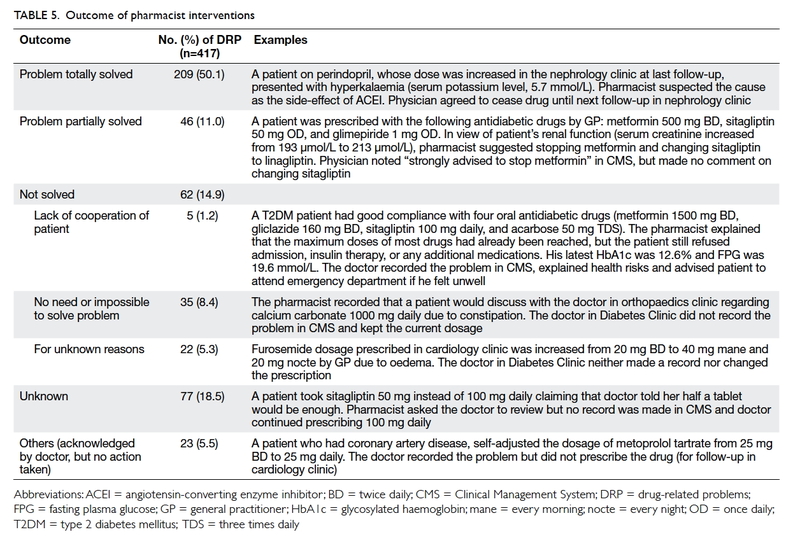 Pharmacist interventions for over half the DRPs were accepted or acknowledged by prescribers. Through effective communication and collaboration within the multidisciplinary health care team, pharmacists had a positive impact on identifying, resolving, and preventing DRPs. Future plans to sustain the diabetes service will enable more local research to enhance medication safety and optimise patients’ medication regimens in diabetes management. We would like to acknowledge Ms Cyan Chan for her assistance in patient screening and data collection, and pharmacists Ms Phoebe Chan (HKU); Ms Amy Chan, Ms Dominique Yeung, Ms Katie Chan, and Mr Ric Fung (QMH); Prof Karen Lam (QMH); nursing and medical staff in S6 Diabetes Clinic, QMH for their advice and contributions to service provision in the study. We would also like to thank Mr Michael Ling and Ms Elaine Lo (Kwong Wah Hospital); Dr Michael Mok (Geelong Hospital, Victoria, Australia); Dr Vickie Tse (HKU) contributing to the independent assessment of clinical severity of DRPs; and Dr Anthony Tam (HKU) and Sharon Law (HKU) for proofreading the manuscript. 1. International Diabetes Federation International diabetes atlas. 6th ed. Available from: http://www.diabetesatlas.org/resources/previous-editions.html. Accessed Mar 2014. 6. Draft statement on pharmaceutical care. ASHP Council on Professional affairs. American Society of Hospital Pharmacists. Am J Hosp Pharm 1993;50:126-8. 7. Pharmaceutical Care Network Europe. The PCNE Classification V 5.01. 2006. Available from: http://www.pcne.org/upload/files/16_PCNE_classification_V5.01.pdf. Accessed 22 Oct 2013. 34. British Medical Association, Royal Pharmaceutical Society of Great Britain. British National Formulary 71. London: British Medical Association, Royal Pharmaceutical Society; 2016. 35. Dean BS, Barber ND. A validated, reliable method of scoring the severity of medication errors. Am J Health Syst Pharm 1999;56:57-62. 45. Galt KA. Cost avoidance, acceptance, and outcomes associated with a pharmacotherapy consult clinic in a Veterans Affairs Medical Center. Pharmacotherapy 1998;18:1103-11. 46. Chan EW, Taylor SE, Marriott JL, Barger B. Bringing patients’ own medications into an emergency department by ambulance: effect on prescribing accuracy when these patients are admitted to hospital. Med J Aust 2009;191:374-7.